Explore the mighty Olympic Ocoee River with the #1 Ocoee River Rafting Company since 1977. Tennessee’s most experienced outfitter, Ocoee Outdoors will guide you through almost continuous class III, IV, and V whitewater excitement from beginning to end. Our guides will help you navigate the turbulent rapids and teach you about the history of the Ocoee and the beautiful area surrounding the river. The Ocoee River is great for beginners and advanced whitewater adventurers looking to make memories that last a lifetime. If you are looking for private Ocoee river rafting trips for families, boy scouts/girl scouts, corporate outings, bachelor or bachelorette parties, church groups — you name it, we’ve got you covered! Our sister company, Ocoee Zipz, allows us to combo Ocoee river rafting with ziplining as well! Being located just a short drive from Chattanooga, Nashville, Knoxville, and Atlanta makes Ocoee River whitewater rafting and ziplining one of the best options for the South. Trip safety and unbeatable customer service are the primary goals and we will bend over backwards to see that you get the very best safety preparations and customer service available. Embark upon an adventure down the Middle Ocoee, America’s most popular whitewater rafting river. A family-fit adventure, ages 12 and up. A full day trip starting with the upper section, site of Atlanta’s 1996 Summer Olympics Whitewater events, and ending with the classic middle. Includes Riverside Lunch! The Hiwassee is one of the most beautiful rivers in the south and is designated as a Tennessee State Scenic River. The Class I and II whitewater is family-friendly. 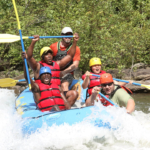 Review your Ocoee Rafting Adventure Dashboard below to find information about Ocoee Outdoors. For anything else, drop us a line. Ocoee Outdoors has been the choice of the South for over four decades, but we’ve never forgotten who made us the whitewater leader in Tennessee — You. More people have chosen Ocoee Outdoors than any other Tennessee outfitter and not just for our staff, guides, and great value. We look at each guest as a vote of confidence. Confidence in our dependability, experience, and performance. Confidence that they’ll receive genuine value for their money, and most of all, the confidence that our quality will satisfy them every time. Ocoee Outdoors delivers the best expeditions on the Ocoee River. Period. Best on the Ocoee. Goes above and beyond. A very organized group staffed by experts…safety was their first concern.